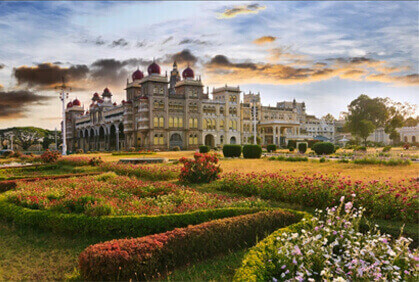 Bengaluru, a city in Southern India, is popularly known as the India’s Silicon Valley and IT hub of India. India’s Silicon Valley is a preferable work place for tech enthusiasts and tech-savvy expats. While corporate giants such as Google, Dell, and Amazon take up a significant share of the sector, every week, a few new technology start-ups join the bandwagon of IT companies in the town. The development of the high-tech industry has turned the city into one of India’s fastest growing metropolises with a large number of people migrating to this city every day. 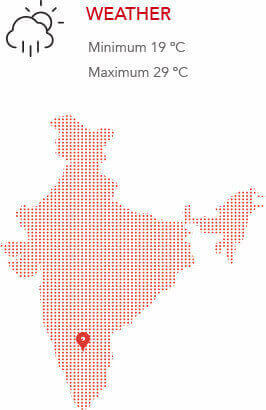 The Silicon Valley of the country is one of the most desired cities in the country. The city is known for its beautiful weather that generally lasts throughout the year. With such a vibrant tech-savvy population, Avis Bengaluru provides the best solution to car rentals in Bengaluru. It provides multi-dimensional services of the self-drive cars and chauffeur drive cars. Booking a self-drive car in Bengaluru is absolutely feasible using the Mobile App; just download the Avis India Mobile App, select your city, fill-in your rental details and choose from a wide range of fleet size of around 2500 cars. Once you receive the confirmation for cab booking, you can enjoy your ride throughout the city without worrying about the hassles of booking a cab again and again. Availability of an economic rentals in Bengaluru has reduced the dependency on public transport. Cars for self-drive in Bengaluru are in all-time high demand as it is more feasible to get an affordable self-drive car rental in Bengaluru to avoid the daily hassles of commuting through public transportation facilities. Avis Bengaluru serves all your needs without the expenses of owning and maintaining a car. In a busy city like Bengaluru, the hectic work schedules start taking a toll on your health and make your life monotonous. 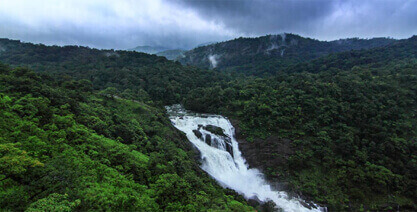 A small break is always good to rejuvenate and nothing can beat a short self-drive trip to a bewitching weekend getaway. 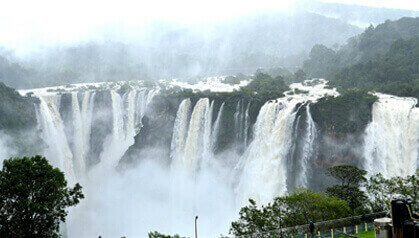 Luckily, Bengaluru is blessed with some of the most picturesque getaways in India. From palaces to forts, natural rock formations to hills, lakes to waterfalls, there’s almost everything in and around the city, to satiate your wanderlust. Also, cars on rent in Bengaluru for self-driven trips to these stunning getaways are available at pocket-friendly prices. If you’re planning an amazing weekend trip, take an Innova self-drive rental Bengaluru and be the master of your own destiny from behind the wheel of a car. You can hire a self-drive Avis cab in Bengaluru via credit card/debit card/ mobile wallet, which provides simplified and convenient booking process with faster refunds. The transaction for the booking is quick and simplified, and payment is done without the lengthy paperwork. The Ulsoor Lake, also known as Halasuru, is in central Bengaluru, close to M.G. Road. 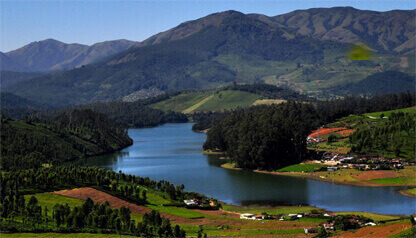 The lake was formed for harvesting rainwater and has a surface area of 125 acres. 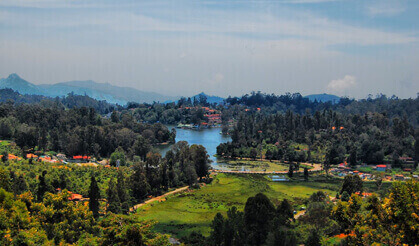 The lake is an interesting location for tourists as it has boating and cruise facilities meant for visiting beautiful islands that contain various kinds of flowers, birds, and insects. The Sri Guru Singh Sabha Gurudwara, on the edge of the Ulsoor Lake, enhances its beauty and attraction for the visitors. ISKCON stands for “International Society of Krishna Consciousness” that bears 400 temples across the world dedicated to Lord Krishna. Amongst these, the ISKCON temple in Bengaluru is the largest. 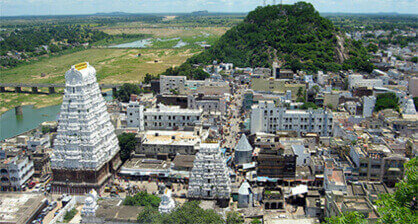 Built atop a hillock, the temple offers visitors an enchanting view of the surroundings. The architecture is a mixture of neo-classical and Dravidian style, and the large prayer hall can accommodate 2,000 devotees. Roof paintings depicting the life of Krishna are unique and informative. 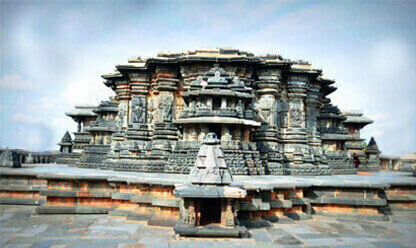 Bull Temple in Bengaluru, also known as ‘Nandi Temple’ or ‘Bhoganandiswara’ temple, is a sculptural masterpiece. 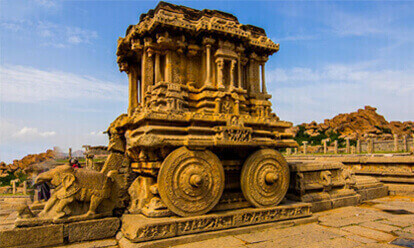 It is dedicated to Nandi, the bull, who is considered as Lord Shiva's Vahana or vehicle, according to Hindu mythology. It has a large sculpture of bull, which is about 4.6 metres tall and 6 metre long. One of the distinguishing characteristics of this structure is that it has been carved out from a single rock of granite. Someshwara Temple in Bengaluru is dedicated to Lord Shiva. It is one of the oldest and biggest temples of Bengaluru, reminding us of the rich heritage of the Chola Kingdom. The marvellous architecture of the temple with glorious Rajagopuram (tower) and Dhwajastambha (massive pillar) in the entrance of the temple, attracts devotees from far off places.